I hear these words a lot when I coach executives. I hear it in reference to launching a new part of a business, solving a complicated problem or dealing with a challenging stakeholder. More recently though, I am hearing it in reference to sponsorship. The sponsorship relationship is a powerful relationship with tremendous significance. Many of my clients who experienced the professional and personal benefits of sponsorship early in their careers are now losing those sponsors to retirement. My clients are at a loss – they’re not quite sure what to do about continuing on in their careers without their sponsor. I work with many executives who made it to where they are not only as a result of skill, talent, and opportunity, but also through meaningful mentorship and sponsorship. While mentors support leaders in their readiness for moving up by providing good counsel, keen observation, and balanced feedback from the context of the broader organization, it is the strong sponsors that help make promotion happen. It is the sponsors who have the influence and political capital and are willing to use it on your behalf. They have the professional “street cred” to put your name in the hat for strategically-important opportunities and raise the chances of your name being the one chosen from that hat. For those of us who support leadership development and the sustained success of organizations, here’s the most important question for today – how can we support our high potential talent in developing sponsorship that enhances their respective trajectory throughout a leader’s career? In watching large athletic events, I reflect on the corporate sponsors that support them. These sponsors provide financial capital and support to ensure success of the event and even the athletes – which is exactly the role we expect sponsors to play. Sponsors are willing to invest their names and reputations because they believe not only in the cause, but also in the talent and, then as a result, the benefit from that investment. Athletic sponsors are strong, international brands willing to invest in the cause that is inherent in athletics and are betting that they can influence the buying decisions of their viewership. The same is true for a leadership sponsor. A good, strong sponsor is someone with a strong personal or professional brand, who believes in others’ potential and is willing to invest their own leadership capital in you. Regardless of age, experience, industry, or where you are in your career, sponsor relationships matter and need to be cultivated. What is the kind of work I want to be doing? Who do I want to serve and how do I want to serve? Who has the influence, respect, political and business savvy to help me get there? Sponsorship relationships are a two-way street. They are established and then strengthened on trust, loyalty, and reciprocity. Special note: Both you and your sponsor are in choice to be in that relationship together. It is more often the case that the sponsor chooses you versus you choosing the sponsor. There are ways, however, that you can increase your chances. As a child, I was raised with my mom’s most famous saying, “you become like the people you surround yourself with, so choose wisely.” The same is true when considering a sponsor. Choose wisely. Be a keen observer of the behavior of potential sponsors and the reactions of others to their behavior. At the same time, recognize that you must earn the support of your sponsor. Your job is to demonstrate competence, confidence, initiative and a willingness to give back to your sponsor in a way that supports their success, as well. Keep in mind that both you and your sponsor are an extension of the strengths of the other’s brand. How well are your potential sponsors positioned within the organization? How do you know? Who knows you and the depth, innovative, quality of work you do for your clients and your teams? Who needs to know? Who are the individuals that can have informed opinions and conversations about you and what you are doing? Do they know enough to be able to defend you and what you are doing/can do? How are those individuals perceived in the broader organization? What type of respect do they garner and influence do they wield? Who is in their inner circle? Who is in yours? Are these the right people for you? How can your potential sponsors help you extend your networks in a powerful way, provide highly visible stretch assignments, broad organizational context relative to challenges the organization is grappling with and how decisions around those challenges get made? Is there are project that a potential Sponsor is engaged in that plays to your strengths and passions and would allow that sponsor to see you in action? How might you ask to be a part of that project? How would you be able to add value and support to your sponsor? As with all strong relationships, the sponsorship relationship thrives not just on trust and reciprocity. It also thrives with and investment of quality time. Special note: Much of that responsibility will (and should) fall to you. You must take ownership of how this relationship develops and grows. It is up to you to find ways to connect with your sponsor and to share in what they are passionate about. It is up to you to seek input. It is up to you to be clear and discerning about your “asks”. It is up to you to seek opportunities that provide the stage for your best performance. It is up to you to communicate your story to your sponsor in such a compelling way that he/she has no trouble representing you. And it is up to you to deliver exceptional performance. Sponsors tend to gravitate to those with great leadership potential and demonstrated exceptional performance. Special note: Because you are well-mentored does not mean you are well-sponsored. Sponsorship is reciprocal stewardship. Your sponsor puts his or her reputation on the line for you and you put your talent and commitment to work for them and for the organization – exceeding expectations. 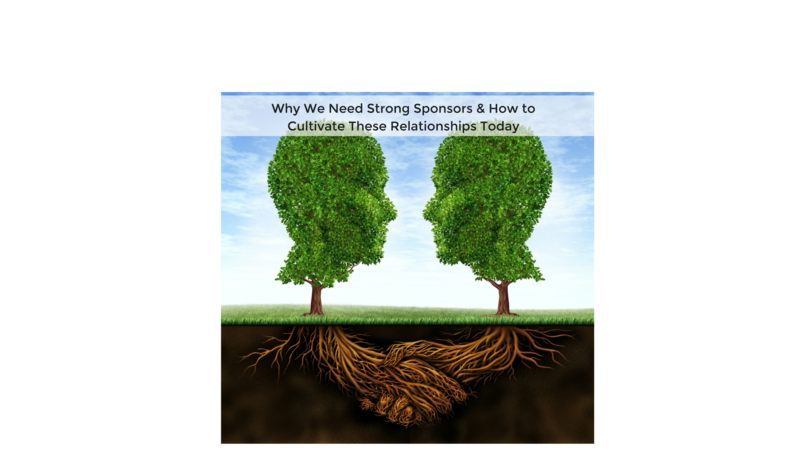 One of the challenges associated with creating sponsorship and maintaining a strong relationship with your sponsor is that we forget to keep forging these types of relationships with other leaders. We become comfortable knowing that we have someone who has our back and at the same time is helping to pave the way from the front for future roles and success. Sponsorship relationships tend to occur organically, so be open to forging new relationships, connections and potential sponsorship relationships where you can sponsor someone else. The power of a strong sponsor is the legacy he or she leaves on your life – and what that relationship helps you to realize about who and what you see for the future of business, as well. Now is the time. Rather than worrying about what to do, begin to reflect on what matters to you in your career and with thoughtful intention, identify those individuals that have the power to help you get there.